Columbus Historical Preservation Trust, Inc. sponsors professionally produced events performed by theater troupes from Austin, Houston, and Deer Park, Texas. 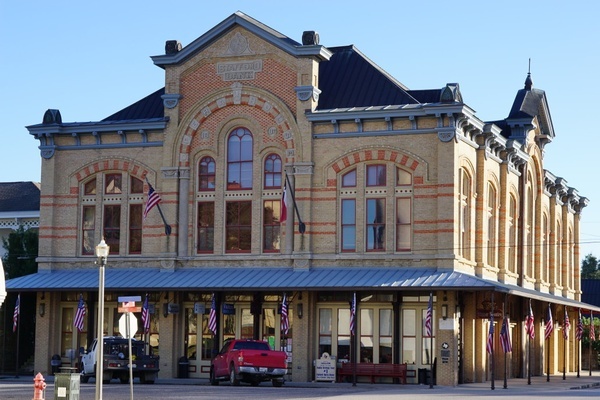 The theater productions are performed in the 1886 Stafford Opera House designed by the respected Galveston architect Nicholas J. Clayton, from a commission by cattleman and banker Robert Stafford. The building was beautifully restored in the 1970s. In addition to the theater productions, the site serves as a meeting facility and a museum. On record as the state’s largest flat floored opera house, the building features a copper, mansard roof, curtains painted to resemble those which originally hung over the stage, and a room containing the vault original to the period 1886-1890 when the building housed a bank on the first floor. The mission or purpose of CHPT will be to maintain, preserve, and present historic sites in Columbus, Texas, for the appreciation and education of the public; stimulate interest and enhanced understanding for the heritage of Columbus, Texas; present cultural events that further the purpose of the organization; encourage tourism in the Columbus, Texas area; and promote volunteerism that furthers the purpose of the organization. The 1886 Stafford Opera House is also a gorgeous, elegant venue for special occasions such as weddings, proms, engagement parties, company parties and more. Feel free to drop by the Chamber of Commerce office to view this beautiful venue.